The last time I was in Singapore, I avoided visiting Clarke Quay because of its reputation. All of the guidebooks and online resources said it was a clubbing district so I thought it would be full of clubs and similar to Roppongi. 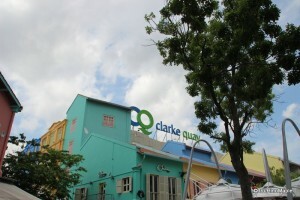 This time, I wanted to visit Clarke Quay because they have a nice brewpub that makes their own beer. I heard it was a good place to visit and when an old friend told me that he was living in Singapore, we met up for lunch at Brewerkz. On my last day in Singapore I had a lot of time to burn as I had a late flight. 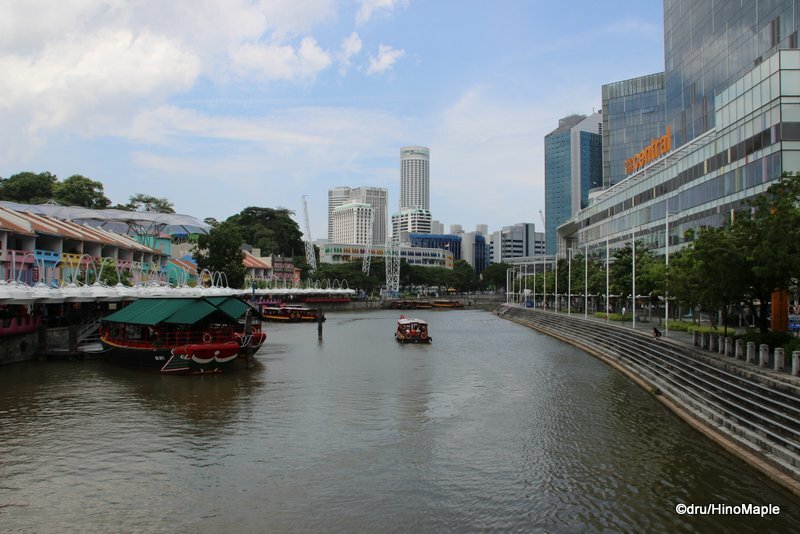 I didn’t want to really go far from the city centre so I decided to give Clarke Quay a second look with the ample time I had to just see what things were about. I thought it was a nice place and a lot better than I had expected. I think I might even head back there next time and stay somewhere nearby. It isn’t as good as Bugis in terms of shopping but there was just a lot more to do at night than Bugis, and it would provide a nice change compared to my previous trips to Singapore. 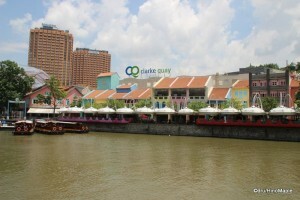 Clarke Quay is not a big area; as is almost every area of Singapore. From my understanding, it is an area the straddles the Singapore River from New Bridge Road to Clemanceau Avenue. It is basically a 1 block stretch along the river with converted old warehouses and other older buildings. 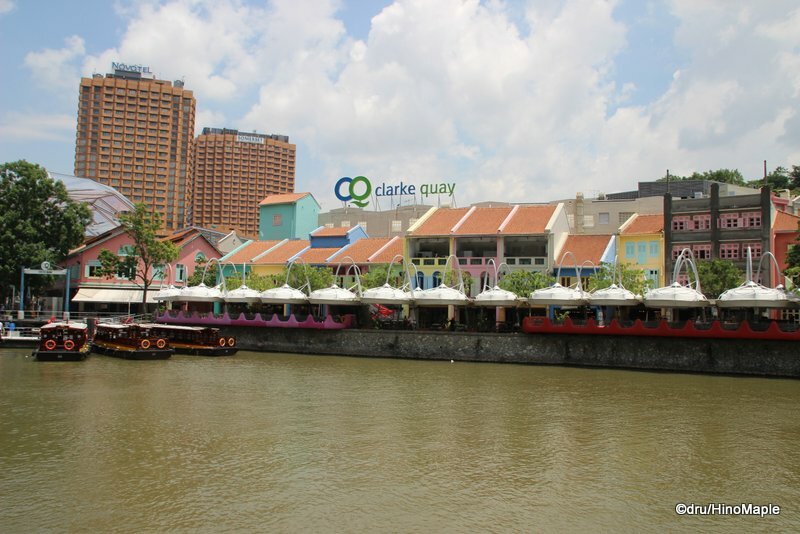 The look along Clarke Quay is very distinct. It has a party like look in the day but it is pretty tame. 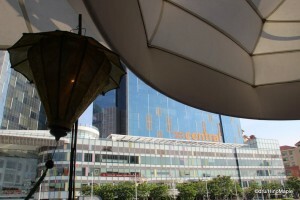 There are several shopping areas and you can walk along the river easily but be aware that it is pretty hot and humid so it can be a chore to see everything. On the north side of the river is a very interesting complex. It is easily recognizable by the large Clarke Quay sign on the top making you think that is Clarke Quay. For all I know, it could be but I figured Clarke Quay straddles the river. The complex on the north side isn’t a large complex but it is large enough to hold several different restaurants and bars. The area is pretty good and similar to Boat Quay, but without the persistent pushers trying to get you into their shops. I took a little time to relax on the river at a Vietnamese restaurant to enjoy a beer and the view. It was right across from a shopping mall called “Central”. The bar was nothing special and they definitely benefited from the view and the fact that they had a happy hour discount of 50% for all drinks. I only had 1 drink and the servers were all typically rude. Obviously they didn’t want to work there but I was content to just relax and enjoy the view as much as I could. While relaxing at the Vietnamese restaurant, I came to realize that Clarke Quay is a hub of boating activity. It is a major stop for the junk boats that ply the Singapore River. While I was enjoying a drink on the river, I also enjoyed watching the junk boats at work. I was next to the main terminal in Clarke Quay and watching the drivers and their assistants work on docking at their berth was pretty interesting. They were all old hands at that job and were surprisingly nimble at manoeuvering their junks. The berths were barely wide enough for each junk and they would just nonchalantly swing their boats around and dock as if it were nothing. A couple times I felt they were going to slam into the main dock but I don’t think they did. At times, they would even yell at each other to get out of their berth as the berths were in high demand. While the berths themselves were in high demand, the actually boarding and off-loading of passengers was kept to just one berth. It was a little strange to see all of them jockeying for position when in reality they weren’t really doing anything. I’m not really interested in trying out the boats and after watching the people boarding and off-loading, I’m sure it is nothing more than a tourist attraction that I can easily handle on my own two feet. The restaurants in Clarke Quay feel very touristy. They were all hawking something and it didn’t appear that many locals really frequented this area. I am not too surprised to be honest. The river side restaurants had great seats but they seem to charge a premium on everything. The beer wasn’t too bad with your typical Tigers and Singhas but I was somewhat unimpressed by everything. I felt as if the places away from the river would have been a bit better, service wise. I really wanted something on the river because I was on vacation and the river provided better views. I didn’t mind the premium but it wasn’t as relaxing as it could have been. The one place I did like, but I didn’t eat outside, was Brewerkz. It is a microbrewery in Singapore and being the beer nut I am lately, I had to go. I needed to try the local beer of Singapore and to see if it was any good. I’ll write a bit more in a future post, but let’s just say it was pretty good overall. Clarke Quay lived up to all of my expectations, and that really isn’t saying much. 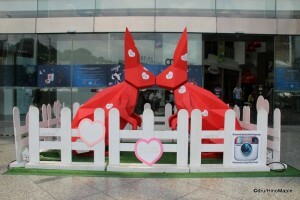 I felt that Clarke Quay is a tourist destination with a few hidden gems in it. It is also a very popular place for Japanese ex-pats. With many Japanese restaurants and shops, it’s no wonder why they like it. The area is also pretty tame compared to the “real” Singapore like Bugis. I admit that Bugis probably isn’t the “real” Singapore either but Clarke Quay felt very much a sterilized tourist destination. I would return again and I would consider a hotel in the area next time as it just makes life easier. If I were to live in Singapore, I doubt I would bother living in that area as it is also pretty expensive. I would enjoy visiting the area and grabbing a couple beers at Brewerkz from time to time, even though it is pretty expensive in the end. 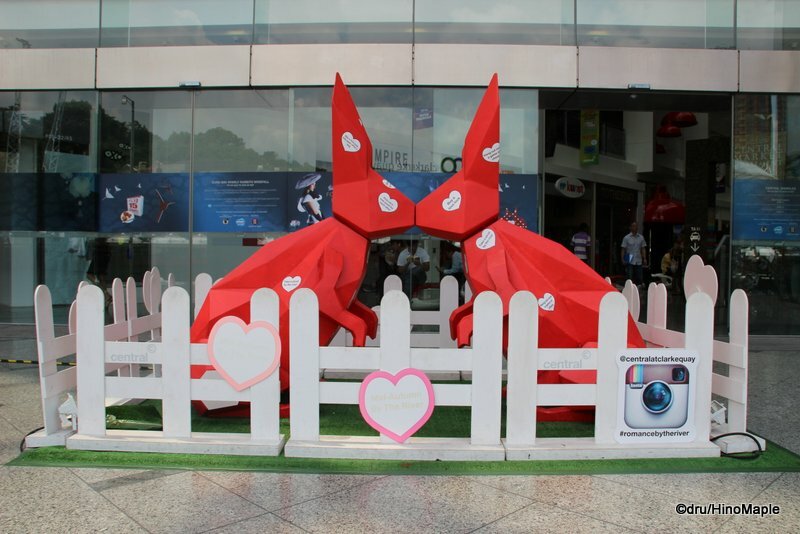 This entry was posted in East Asia and tagged Brewerkz, Clarke, Clarke Quay, craft beer, junk boat, Quay, Singapore by Dru. Bookmark the permalink.